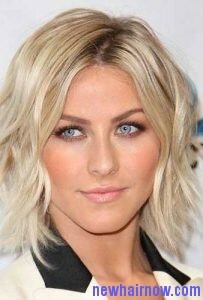 Julianne Hough has got shaggy bob is a great way to make you face look flatter. It is also very easy to style as well as manage compared to other similar hairstyles. There are many celebrities who have seen with this type of hairstyle during special events. This style used to be more popular during the 1970s and it can be created at home without getting any help from a hairstylist. To get Julianne Hough style, get rid of little strands on your hair by combing it well. Then spritz the hair with water and start dividing the hair into seven parts including right side, left side, top of the head, right crown, left crown, right nape of the neck and left nape of the neck. Then secure each part with a hair clip and leave half inch of hair around the bottom perimeter of the hair which will help to determine the length of the style. Take one-inch section of hair straight up and start cutting it. Angle the scissors up and away from the head to get a more tousled look. Continue cutting small sections of hair and after reaching the nape sections cut off a quarter-inch more than rest of the hair which will make it look more shaggy. Next comb the hair after finishing the cutting and leave the hair to dry naturally to create more even more volume. Finally check the hair for any cuts that have been missed.